← A Couple of Personal Bests and Gifts from the Zhashagi River. Like all good things eventually do, the early season tributary river walleye run on Lake St-Francis has come to an end. Based on what I’ve gathered from people around the area it has been a successful year with decent fish caught daily. Personally this has been one of my best early seasons in terms of quantity and quality of fish. Locating fish in the spring is fairly easy on Lake St-Francis. The fish are shallow and somewhat predictable. I’m no biologist but it seems to me the big female walleye linger on in the shallows longer than the males do. I tend to find you have a good chance at 5+ pound fish if you push the limits of fishing the shallows. You will likely see numbers of fish decrease but the ones you do catch shallow later in the spring going into early summer will be bigger. 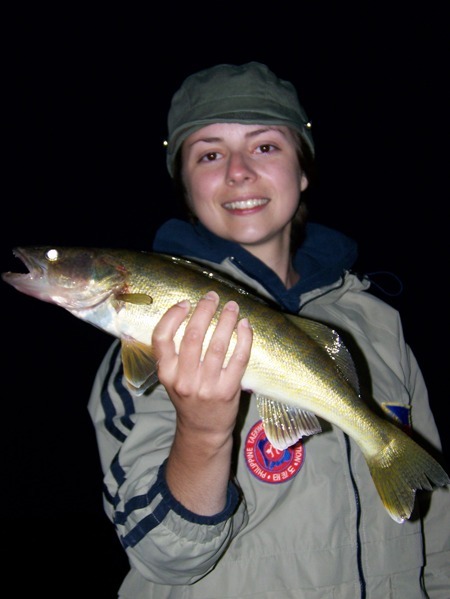 Keep in mind here the only ways I am able to differenciate a male or female walleye are size (females are larger) and the texture of their belly (you can tell it housed egg sacks). I am certainly not claiming to state this as fact, but rather sharing my personal observation. I tend to thing the females stay back longer. Perhaps someone can confirm this. During the post-spawning period the fish are feeding trying to re-gain energy spent spawning. 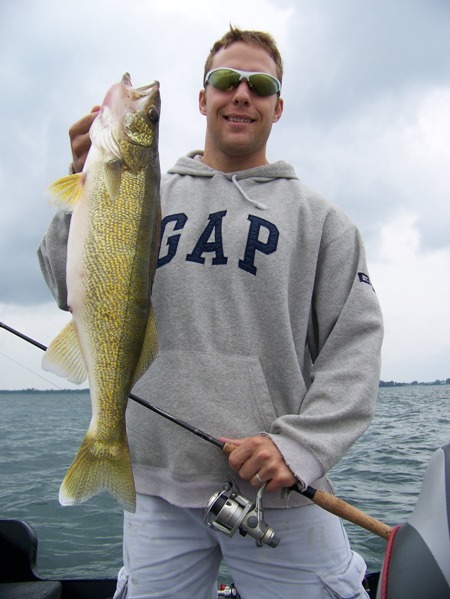 This is when you have a good chance at catching some of the system’s better walleye by targeting the shallows providing you have decent cover (rock or submerged wood are best), flowing water and ideally feeder rivers or creeks nearby. 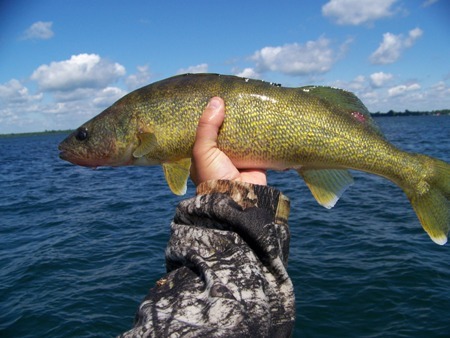 However when the water starts to warm over that 68°-70°F mark the walleye spread out into the main lake basins and become much more difficult to find and to catch. Around June 20th we started off looking for fish in the “in-between areas”. I know where walleye spend the majority of the summer months and where they spawn. Based on that I have found areas on the map where they would be likely to stage temporarily in between spring and summer. This period can be tricky. I tend to look for spots where the water is about 65°-68°F that offer the same cover as the spawning area. In this case, a large shelf close to a deep basin, fed by a creek with good running water and loaded with perch and other forage. There is also plenty of newly green vegetation there, coontail in particular. I’ve caught plenty of pike in this spot in the past during the early season and I figured the weeds were still low enough so that we could get away trolling crankbaits in about 12-14 feet of water. We didn’t find walleye that day but I’m not convinced they weren’t there because we did catch this reasonable musky and my very first Freshwater Drum. Both these species tend to be found in the same areas as walleye. I’ll take a minute to talk about this fish you see in the video below for a second. 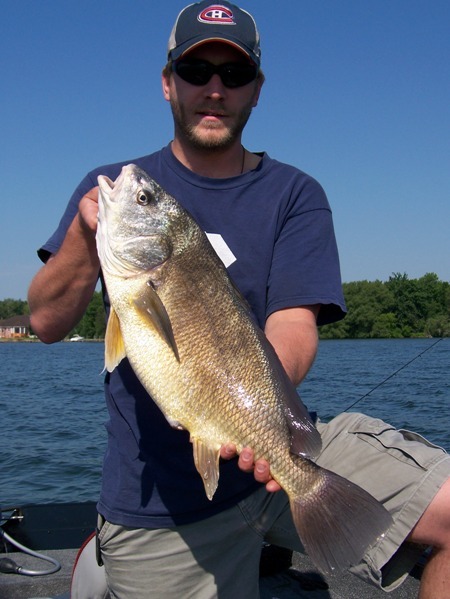 Freshwater Drum are a really cool fish. There is something exotic about them; like catching a mix between a redfish or snook on shallow ocean flats, until you snap out of it and realize you’re in Ontario. Other than rare mentions you don’t often read or hear about them, but I have seen them roam the shallows while snorkelling before; particularly just before dark. I’ve also spoken with people who have caught them on jigs in deep water. Freshwater Phil , a regular to this site and Lake St-Francis, tells me their flesh is similar in taste to that of a walleye but that they have a different bone structure and are difficult to fillet. This is probably why they aren’t a very popular game fish. Which is too bad because they sure are fun to catch and it would be interesting to try and target them. But that’s for another time. If you want to find out a little more about them there is a decent write-up about them on wikipedia here. A few minutes after we released the Drum Mike’s rod bent in half when a young musky was fooled by a fast moving crankbait ripping through the top of the coontails. 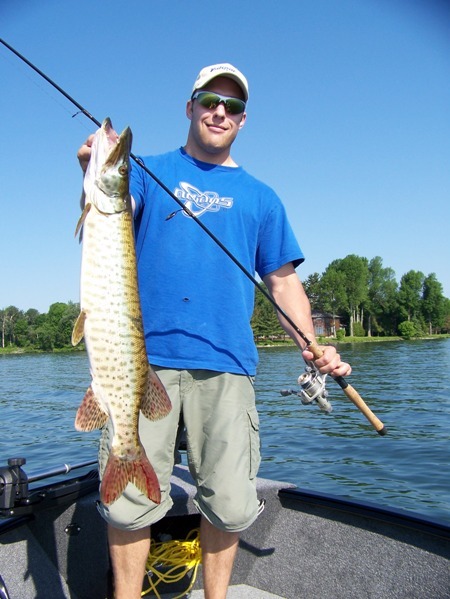 I’ve noticed that if you find areas where walleye are holding, chances are muskies aren’t too far away. This isn’t a monster by any means but it makes you wonder about the odd bite-offs we get trolling the shallows for walleye every year. I can’t stand leaving a Rapala in a fish’s mouth but there really isn’t much you can do about it because using a leader would all but nil your chances at fooling walleye. I took Monday off on the weekend so I had 4 days to focus on fishing. I loaded up on leeches, minnows and night crawlers and decided to start by targeting deeper fish. I know walleye in the St-Lawrence system will hold very deep in the summer months, especially now that the water is so clear. On Saturday and Sunday the water was still quite cool so I focussed on the first drop-offs in about 35 to 45 feet of water. I’m guessing the weather, strong winds and high gas prices kept the cottagers and sea-doers at bay this weekend because for the most part it felt like we were alone on the water, even on Canada Day with the weather being near perfect for marine activities. Our first day was spent exploring a summer staging area. A few other boats were out there looking for walleye in 50-60 feet of water but the strong east wind really made things rocky. The East wind is deadly on the Lancaster flats area because of a vast opening of water towards Valleyfield to the East. The waves have many kilometres to travel before they reach you so they end up being massive during East winds. Just ask Mike about his experience in the 4-foot swells on Saturday morning. Let’s just say his breakfast was a waste in a hurry. Seeing as Mike didn’t feel so hot we reluctantly and prematurally headed back in empty-handed on the morning of day 1. That night the wind shifted to the west so I took off on the lake alone after dinner. I located a few huge rock piles that really stirred up the current and focussed on them. I started off jigging 3″ grubs to find active fish and it didn’t take long before I had my first walleye of the weekend on. I lost him at the boat and then had another one grab the twister tail on the grub and rip it off. I also hooked into a few smallmouth including this beauty 18 incher but by that time it was getting pretty dark so I headed in feeling confident that I would find walleye in the morning. This picture is a little strange because I had to set the timer on the camera and it ended up blinding itself out. Now that I knew where to go, it didn’t take long until we were onto fish on the morning of day 2, and for the remainder of the weekend. We had the perfect conditions, overcast, walleye-chop and very aggressive fish. I had them concentrated on a rock pile in about 35 feet of water and they were spitting up minnows like crazy. In a matter of 2 hours we boated 8 fish and most were above 2 and a half pounds with two bruisers mixed in. There is nothing like the feeling of a walleye digging for bottom in deep water. These guys were released to fight another day and they gave us one heck of a good time. The key to getting these big walleyes was definitely good boat control. You need to adapt to the conditions you’re faced with. For example, consider wind direction and speed, and focus on how this will move your boat. The direction of the wind determines your drift route while the speed of the wind will help you choose the best presentation. 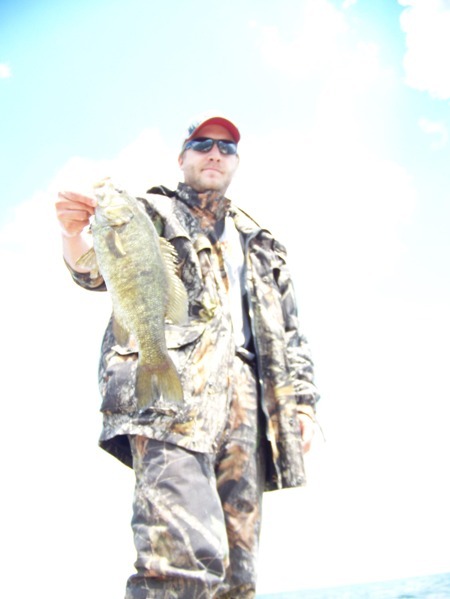 You don’t want to be fighting the wind constantly with the trolling motor so try and use it to your advantage. 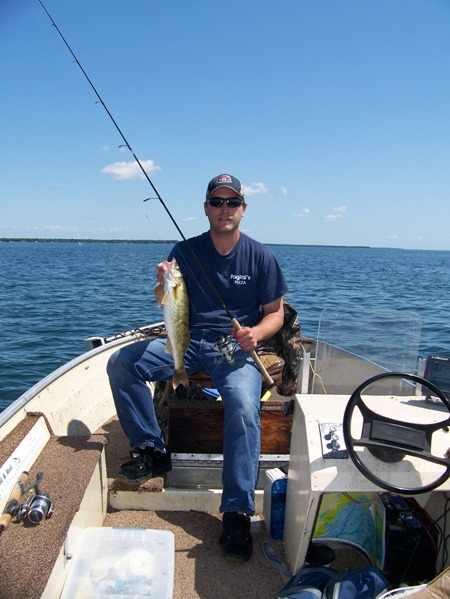 The wind is a strong ally to walleye fishermen when used to one’s advantage. You also need to be ready to change your approach at a moment’s notice when there is a change in conditions. For example, a 1/4 ounce jig might be perfect in windless or low-wind conditions, but when that breeze picks up you’ll likely have trouble finding bottom with it so you need to go to something heavier. Complacency is the enemy. The worse thing you can do is assume that if something worked well for you in the past that it will work every time you’re out there. The best thing to do is try a variety of techniques. When you find something that works, rince and repeat until you’ve spooked the fish or they moved out. 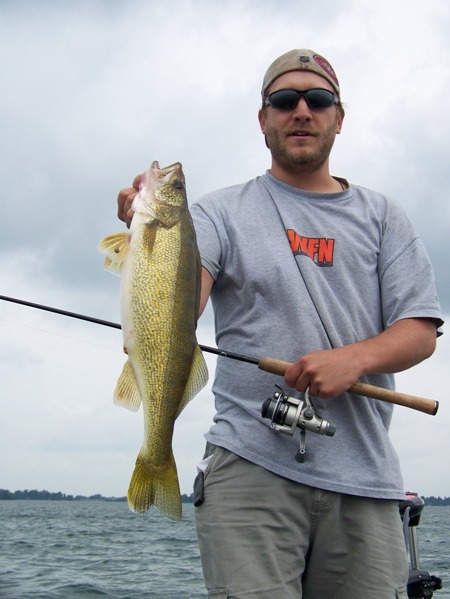 I’ve caught walleye anchored while throwing light jigs down the current into a deep pocket. I’ve caught them pulling crankbaits against the flow on channel edges, vertical jigging on rock piles, you name it. The key is finding what works that day, at that particular moment because sometimes things will change dramatically in only a few short hours. I also don’t waste my time in a spot if there is nothing there. Keep moving and watch the conditions so you can match your presentation to what mother nature is throwing at you. The overcast, windy conditions were perfect but they didn’t last. That night after dinner Mike and Amélie wanted to go out so we hopped into Mike’s Lund towards areas where we had caught fish in the morning. The wind had changed and a cold front moved through. The fish weren’t in that same location anymore buy had moved upstream about half a mile. The bigger fish were harder to catch but after a few adaptations in our presentation we did put Amélie onto her first walleye much to her husband Mike’s content. After a few fish about this size were swimming in the livewell we headed in for a bit of filleting and a cold beer. Rough times I tell you. On the final day of the weekend I headed out with Pat. He ended up being more of a spectator this time around for a reason which eluded us both. He simply couldn’t catch a fish even though he was using the exact same rig I was. As for me, the morning went very well with 5 fish boated and it was the perfect way to end a perfect weekend. At about 11am we headed in for some lunch on a crystal clear, dead calm lake. Later that afternoon when the sun was a its peak we made our way to our favourite underwater island for some snorkelling to end the day, and a fantastic weekend. Give these deep eyes a try. They won’t disappoint you. Nice post Jigger; ;lots of good info. Unfortunately I didn’t have much success with walleye this spring I’m looking forward to experimenting this summer keeping your advice in mind. I also appreciate you stopping on shore to talk to us that stormy night in the Raisin river this spring. Have a good one man. Thanks Dom. We ended up doing pretty well upstream that night. Strangest thing was the fish were hitting hard and then basically not fighting at all on the retrieve. We ended up with 3 if I recall and one heck of a soaker. It really came down hard that night. Cheers, hope to bump into you guys again, best of luck, Jigger.